Warner Bros.' highly-anticipated superhero adventure Aquaman started production in Australia earlier this month, although we haven't seen too much from the set so far. Today we have new videos and photos that show the production utilizing some massive water tanks for some water scenes that are set at the hero's home at Amnesty Bay. This report also reveals that young actor Otis Dhanji, who is portraying the young Arthur Curry, has been spotted on the set. News.com.au reports that filming took place at a custom-made set next to Palazzo Versace over the weekend, where both Jason Momoa and his stuntman were spotted on the set, along with actors playing "big bikies." This report also reveals that, while this shoot was going on, both Otis Dhanji, who plays the young Arthur Curry/Aquaman, and Temuera Morrison, who plays Arthur's human father, were spotted filming at Village Roadshow Studios, filming in the studio's outdoor water tank. The production is continuing with second unit filming at the water tank today, but that shoot doesn't include any of the principal actors. The fishing village set at The Spit, near Palazzo Versace, features a number of shipping containers that are dressed up as shops such as the Amnesty Bay Fish Co-Op and a shop signed Sunken Galleon, which are being built for the six-month shoot. Jason Momoa also shared a photo featuring his fish scale artwork tatoos on his body, which crew members have said take more than two hours to apply before he can begin shooting. The cast also includes Oscar nominee Willem Dafoe as Nuidis Vulko, Temuera Morrison as Tom Curry, Dolph Lundgren as King Nereus, Yahya Abdul-Mateen II as Black Manta with Patrick Wilson as Ocean Master Orm and Oscar winner Nicole Kidman as Atlanna. The latest addition to the cast was Power Rangers star Ludi Lin, who came aboard last week to play Murk, leader of the Men-At-War soldiers. 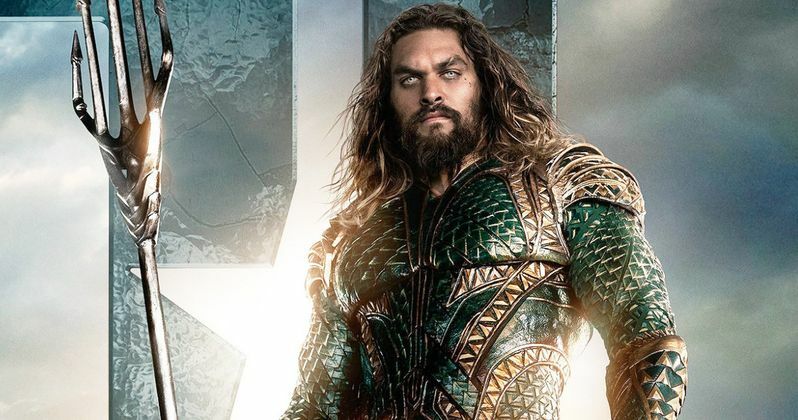 While we still don't have an official synopsis for Aquaman yet, director James Wan did recently share some interesting details about the story. During an interview from October, James Wan surprised many fans when he compared this story to the 1984 adventure-romance Romancing the Stone. The director revealed that the story begins with both Jason Momoa's Arthur Curry and Amber Heard's Mera "not quite clicking with other", but as the story progresses, they begin to work together and become closer and closer. Jason Momoa also described this movie as a "coming of age story," which will take fans into cinematic territory they've never seen or experienced before. Production is expected to last all summer in Australia, with a fall 2017 shoot planned for Italy as well. Aquaman has also finally solidified a December 21, 2018 release date, after being previously set for July 27 and October 5 next year. Take a look at the latest set videos and photos from Aquaman.